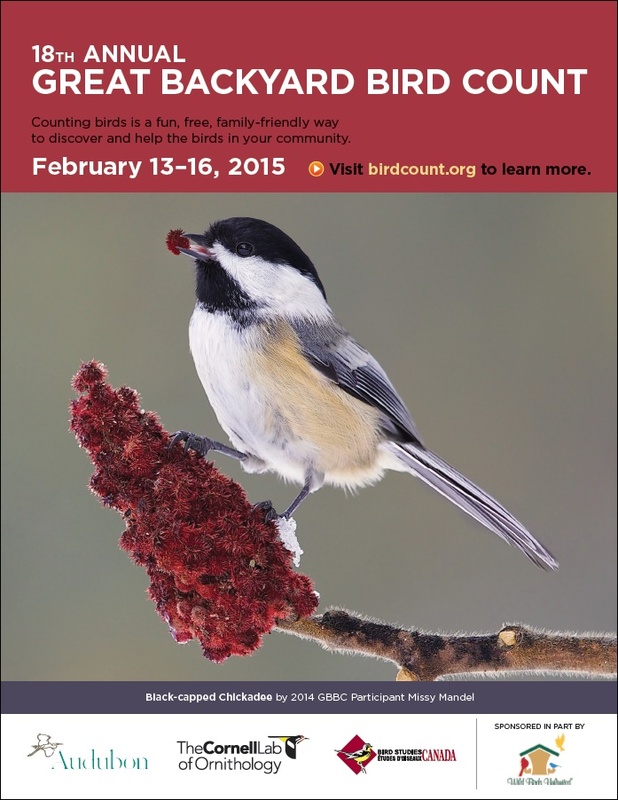 This was our third year participating in the Great Backyard Bird Count at the Mill. We spent about an hour in the (cold!) mornings at the Mill, counting the birds that we saw. A trained ornithologist was present. We are happy to participate in this event every year. RESCHEDULED TO MARCH 8. We held a “Volunteer Open House” to gather together previous and potential future volunteers. We described various ongoing and future projects. Participants learned how to get involved. If you were unable to attend, we asked that you please complete this form and email it to us. You can still do so. Our monthly work day where volunteers come together to work on clean up, maintenance, stabilization, and preservation efforts at the Mill. Note that work days can be canceled or rescheduled due to inclement weather, so if you would like to help out at a work day, please contact us ahead of time so that we may notify you of any changes. This was second year participating in this event. We had a table where we sold merchandise and handed out information about our group. Check out details of the event here. 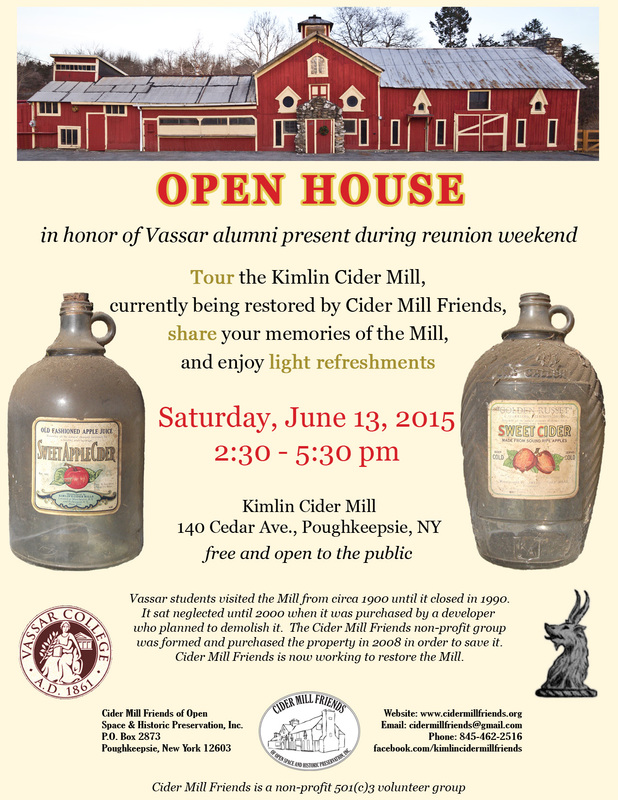 In coordination with the Vassar College Ecological Preserve, Cider Mill Friends has organized a walk from Vassar College and Vassar Farms to the Kimlin Cider Mill. 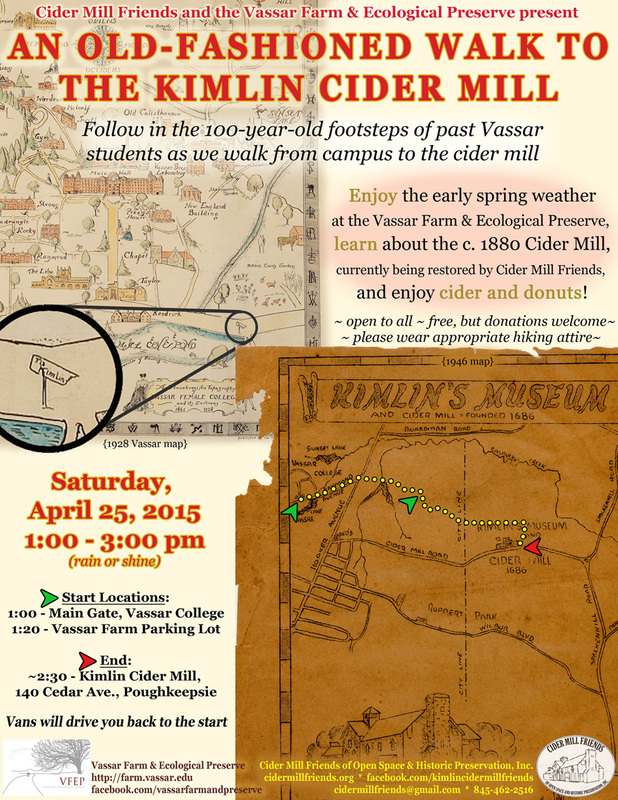 Follow in the footsteps of past Vassar students who walked to the Mill to get cider, donuts, cookies, and generally hang out. More details in the flyer, below. This open house is aimed towards the Vassar College Alumni that will be present for Reunion Weekend, but we welcome everyone to attend. See the flyer below for more information (click on the flyer to enlarge). CMF will have a table at the Hudson Valley Cider Festival at Barton Orchards in Poughquag. Come out, say hi, and enjoy the festival! This is our first year participating in the Hudson Valley Ramble. The guided tour will start from the Visitor’s kiosk located on the north side of the Mill. There will be a short walk (long pants and sturdy shoes suggested) to showcase a bevy of invasive plant species, discuss CMF management strategies, and suggest ways to control invasives around one’s own property. The walk will end with an inside tour of the Mill. Bottled water and cider doughuts will be provided. 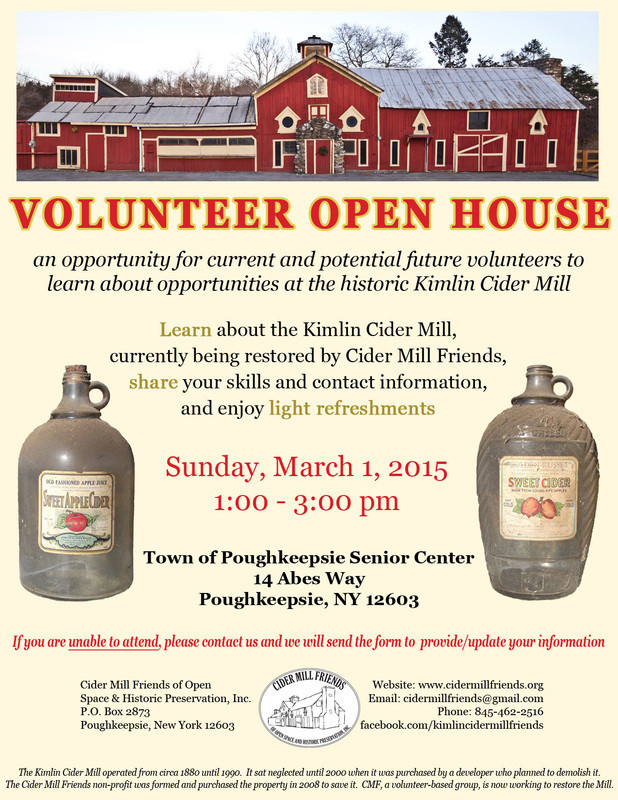 Cider Mill Friends will have a table at the Arlington Street Fair on Raymond Avenue in Poughkeepsie. This is the 16th year of the street fair. During our normally-scheduled work day, we pressed our Kimlin Cider. Six bushels of apples were all chopped up and pressed. Thank you to all of the volunteers!